Sunset at our camp on the Kanab Plateau. It got pretty cold out once the sun went down. We met up with Jerry for lunch and then headed over to the Arizona Strip to start our trip together. 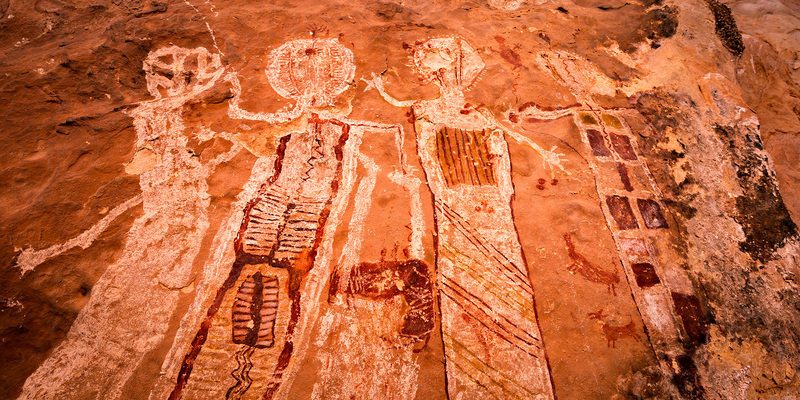 Of course, we made a few quick stops along the way at a few other rock art sites. 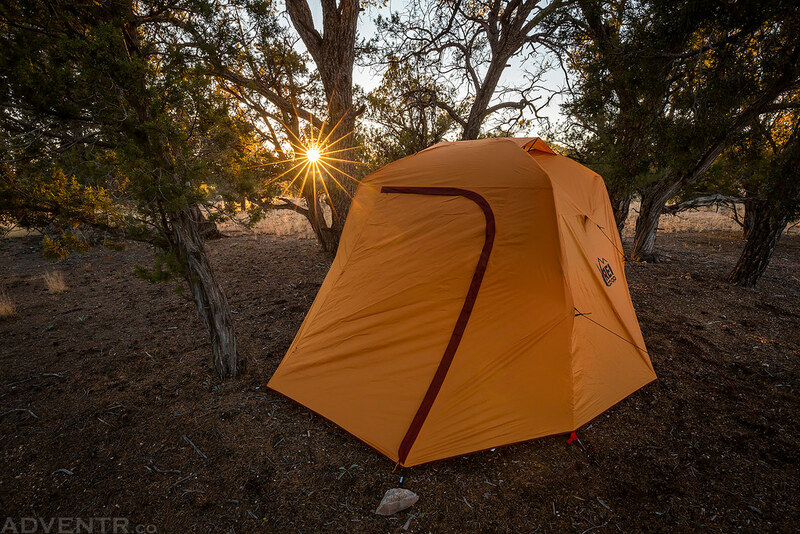 We spent the first night camped up on the Kanab Plateau after a cold front had just moved through the area and the temperature dropped down into the lower 20’s. It was a pretty cold night, but we managed to stay warm. Thankfully, the temperature at night was a little bit warmer once we were down below the rim. There was not a cloud in the sky during our entire trip, so we didn’t get to watch any amazing sunsets or sunrises this time, plus the view to the south rim was hazy everyday which was most likely caused by smoke from the wildfires in California that we didn’t yet know about. Even though it had rained pretty good in the area a few weeks prior, we weren’t sure how much water we would still be able to find so we decided to carry most of the water we would need for the entire trip. That turned out to be a good call since we didn’t find very much water at all, although it sucked carrying the extra weight. Here are a few photos from our long weekend trip into the Grand Canyon. A narrow strip of white pictographs. The glow of soft light on the Esplanade long after the sun had gone down. The Hades Site was definitely the highlight of the entire trip! The detail in these pictographs are spectacular! A closer look at these petroglyphs that have eroded away in an interesting way. Since there were no clouds in the sky at all during our entire trip, I had to add a few sunstars instead! A broken point Diane found along our route on the Esplanade. The skull of a bighorn sheep ram. Spirits emerging from the back of the shallow alcove. One of the very few potholes with water that we would find during our hike. A few potsherds we found below the ledges of our second campsite. This was one of the more colorful pictographs we saw. An evening at camp shortly before sunset. I know it’s hard to tell the scale from these photos, but this is a very long white pictograph. It must have been longer than six or seven feet! Watching the sun drop below the cliffs as we ate our dinner on the Esplanade. The next two photos are of some interesting designs painted on the ceiling of a low alcove that were difficult to photograph. This figure is painted sideways at the back of an alcove. A small canyon cutting through the sandstone of the Esplanade. I like the tiled design of this figure. The Hades Site Alcove with a little sunstar. A few faint mud paintings. I don’t think it is, but it sure looks like elaborate antlers are painted on this white sheep. Our final evening view on the Esplanade. As we hiked out of the canyon on Sunday there was a very frigid wind blowing for most of the day which was pretty unpleasant to hike in, but at least it wasn’t hot out! We were originally planning on spending one more night on the top of the plateau before driving back home, but because of the wind and colder temperatures we decided just to drive straight home on Sunday evening instead. We arrived home late that night and got to relax all day Monday before going back to work on Tuesday. Amazing rock art. I haven’t hiked in that area and don’t expect to at my station of life. been trying to see all I can around Cedar Mesa, but I can’t manage packing and camping. them coming! BTW, wow! “Your mug” is stunning. Thanks for getting it preserved for posterity. Wow! I didn’t know there was so much rock writing in GCNP. Thanks for sharing! Exceptional quality as always, thanks.